Customary law and traditional authorities continue to play highly complex and contested roles in contemporary African states. Reversing the common preoccupation with studying the impact of the post/colonial state on customary regimes, this volume analyses how the interactions between state and non-state normative orders have shaped the everyday practices of the state. It argues that, in their daily work, local officials are confronted with a paradox of customary law: operating under politico-legal pluralism and limited state capacity, bureaucrats must often, paradoxically, deal with custom – even though the form and logic of customary rule is not easily compatible and frequently incommensurable with the form and logic of the state – in order to do their work as a state. Given the self-contradictory nature of this endeavour, officials end up processing, rather than solving, this paradox in multiple, inconsistent and piecemeal ways. 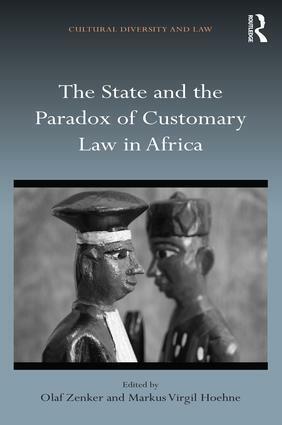 Assembling inventive case studies on state-driven land reforms in South Africa and Tanzania, the police in Mozambique, witchcraft in southern Sudan, constitutional reform in South Sudan, Guinea’s long durée of changing state engagements with custom, and hybrid political orders in Somaliland, this volume offers important insights into the divergent strategies used by African officials in handling this paradox of customary law and, somehow, getting their work done. Olaf Zenker is Professor of Social Anthropology at the University of Fribourg, Switzerland. He has published on modern statehood, rule of law, bureaucracy, justice, land reform as well as conflict and identity formations in South Africa and Northern Ireland. His book publications include the co-edited volumes South African Homelands as Frontiers: Apartheid’s Loose Ends in the Postcolonial Era (Routledge, 2017), Transition and Justice: Negotiating the Terms of New Beginnings in Africa (Wiley-Blackwell, 2015), Beyond Writing Culture: Current Intersections of Epistemologies and Representational Practices (Berghahn Books, 2010) as well as the monograph Irish/ness Is All around Us: Language Revivalism and the Culture of Ethnic Identity in Northern Ireland (Berghahn Books, 2013). Markus Virgil Hoehne is Lecturer at the Institute of Social Anthropology at the University of Leipzig, Germany. He works on conflict, identity, state formation, borderlands, transitional justice and forensic anthropology in Somalia. He is the author of Between Somaliland and Puntland: Marginalization, Militarization and Conflicting Political Visions (Rift Valley Institute 2015), the editor of a special issue on The Effects of 'Statelessness': Dynamics of Somali Politics, Economy and Society Since 1991 (Journal of Eastern African Studies, 2013), and co-editor of Borders and Borderlands as Resources in the Horn of Africa (James Currey, 2010) and Milk and Peace, Drought and War: Somali Culture, society and Politics (Hurst, 2010). Around the world, most states are faced with difficult issues arising out of cultural diversity in their territories. Within the legal field, such issues span across matters of private law through to public and constitutional law. At international level too there is now considerable jurisprudence regarding ethnic, religious and cultural diversity. In addition, there are several layers of legal control - from communal and religious regulation to state and international regulation. This multiplicity of norm setting has been variously termed legal pluralism, inter-legality or inter-normativity and provides a fascinating lens for academic analysis that links up to cultural diversity in new and interesting ways. The umbrella of cultural diversity encompasses various population groups throughout the world ranging from national, ethnic, religious or indigenous groupings. This series particularly welcomes work that is of comparative interest, concerning various state jurisdictions as well as different population groups.